The Scoresheet web-based draft is not one where you have to log on at a specific time to make a pick, nor is it a chat room draft where you are online for hours. Instead, when it's your team's pick, our draft program will select the top available player from a list that you can create, change and save to the Scoresheet website at any time. By being able to make changes at any time, you can adjust your list before every one of your picks, giving you the same control as if you were at a live draft. However, you may also choose to leave your list alone, allowing our draft program to select players according to your rankings, and optionally draft a balanced team for you. Your draft list will be password protected so that only you can see it. Trades can also be made during the draft, including trading of draft picks. As each draft pick is made, it is posted for everyone to see, and your league rosters are updated in real-time as the draft progresses. Team owners using web-based drafting will start by creating their player ranking list on their league's webpage. As each owner's turn to pick arrives, the draft program will select the highest listed undrafted player on the team owner's ranking list, subject to the optional Roster Balancing procedures. Roster Balancing can be turned on and off for your upcoming picks at any time during the web draft. For single-season and new continuing leagues, the draft order in Round 1 will be randomly assigned, and the draft order will reverse in each subsequent round. Team 1 will pick first in Round 1, last in Round 2, first in Round 3, and so on. For existing continuing leagues, the draft order will be in reverse order of the previous year's standings in every round. As each draft pick is made, it will be posted to the respective league's web site. Ranking lists can be added to or changed at any time. 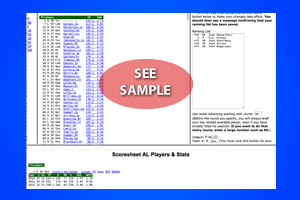 If an owner's list becomes depleted (has no available players left at positions needed by that owner), the draft program will automatically draft an available player for that team with the highest Scoresheet points scored from the previous season. As long as a team owner keeps adding to his ranking list as the draft goes on (or submits a long enough list initially to last all 35 rounds), all players for that team will be picked from the owner's ranking list. The start date of the web draft depends on when you join a Scoresheet league, and drafts will end a few days before the start of the season. The first drafts will begin in early February and will run for about seven weeks, with approximately one round per day. We will be forming more leagues through mid-March as team orders are received. Draft schedules will be posted before drafts begin so that team owners know when each of their picks will be made. Remember, you do not need to be logged on at the same time with other owners in you league. The draft program will always select the highest listed available player on a team owner's list when it is time to make a draft pick. Unlike some e-mail drafts where one owner can hold up the entire draft, draft picks will be made as scheduled and the draft program will pick a default player if necessary. You can use our standard trade form on the Scoresheet website to report trades of players and/or picks at any time. Trades become effective as soon as both owners involved report it. Player eligibility during the draft will follow our "draft by list" rules. For instance: in an American League draft, a player who is on our National League player list cannot be drafted. The list of eligible players will appear on your ranking list page, including all undrafted players in your league. 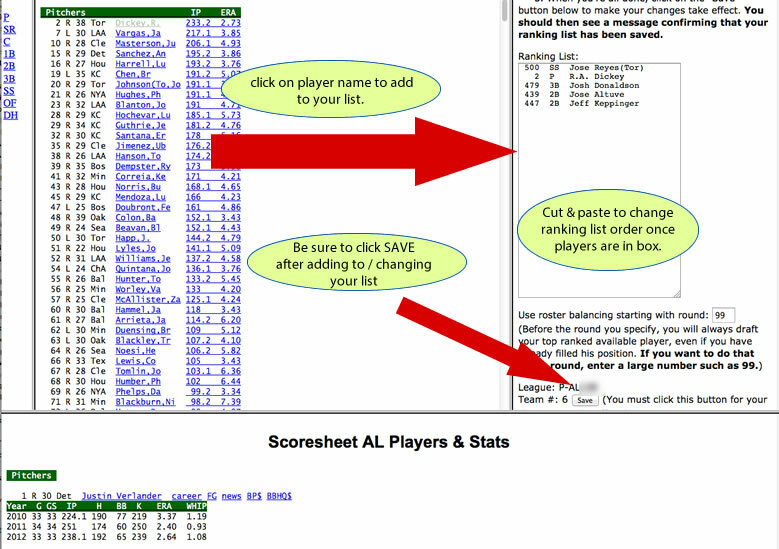 If you want to draft a player who doesn't appear (usually an obscure minor leaguer), send us an e-mail and we will add him to our list of eligible players, as long as he is under contract to a team in your type of league (AL or NL), and is not listed on the other league's Scoresheet player list. For owners with internet access who are playing in leagues that usually draft by mailing draft lists to our office, we heartily recommend joining a web-based draft league instead. Also, leagues that generally conduct their own 'private' drafts can use the web-based draft system if they desire. 'Private leagues' are able to set custom starting and ending days for their draft - a schedule will be created with the correct number of rounds per day to accommodate the starting and ending days. If your league wants to use the web-based draft system with a custom draft schedule, please contact the Scoresheet office. NOTE: The Scoresheet office will make a player ranking list for any orphaned teams in your league, and will also enter a list for any owners who do not have internet access. Having an orphaned team in your league, or an owner who can not utilize the internet, will not prevent your league from using the web draft.